When I booked a trip with arsviva to Bologna and other towns in the Emilio-Romagna region, I was most interested in seeing the mosaics at Ravenna. I had heard so much about them and yearned to see them with my own eyes. While the other sights did not by any means disappoint, Ravenna proved to be as magical as I had hoped, even more so. 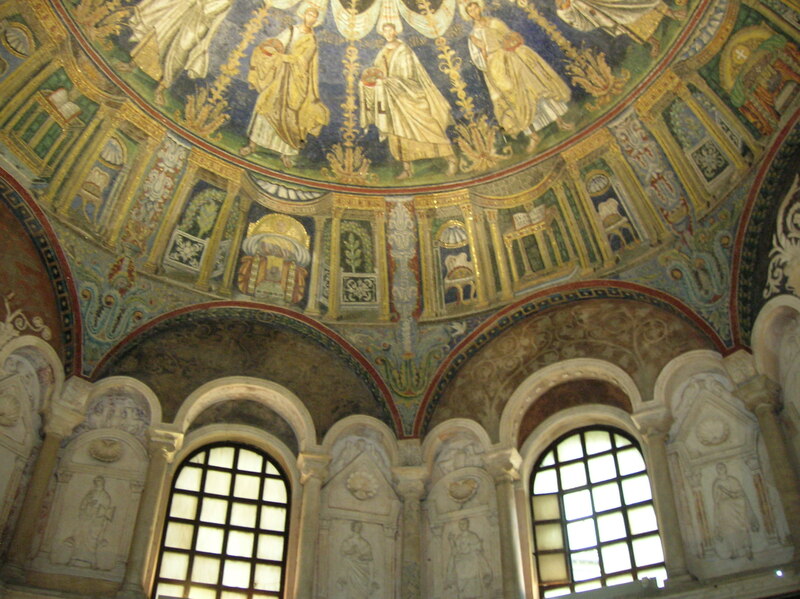 I was fascinated by Ravenna’s glorious history from the 5th to 8th century AD. 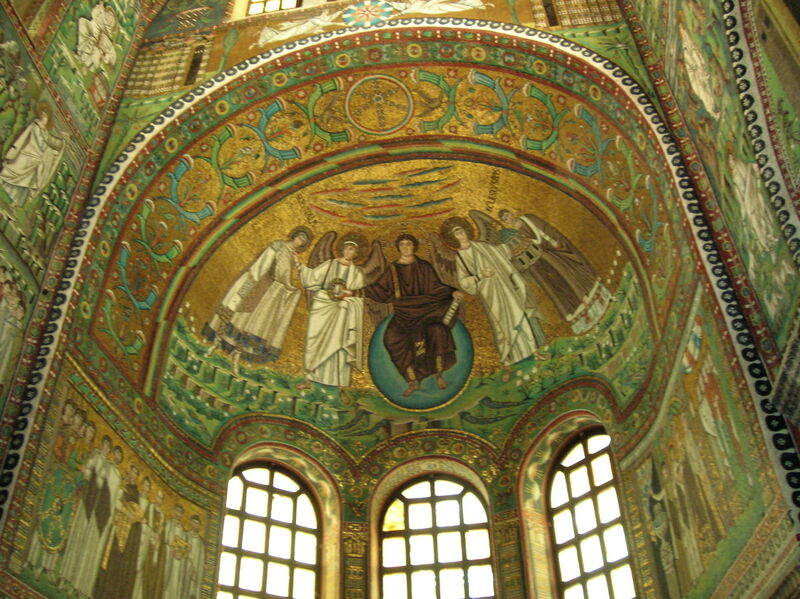 The golden days of Ravenna began when the city was designated as the capital of the Western Roman Empire in 402. Though the Roman Empire came to an end in 476, it did not at all mean the end of Ravenna’s influence in the world. 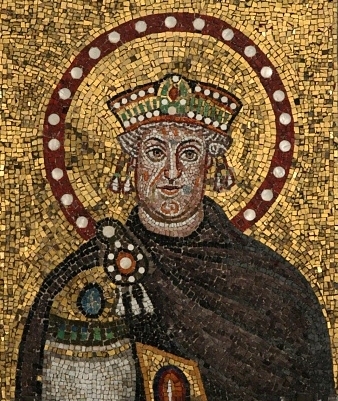 During the reign of Ostrogoth Theodoric the Great, who had captured the city in 493, Ravenna prospered, though 19th century poetry would present him as a sinner and persecutor. In charge for more than 30 years, Theodoric was set on Romanizing the kingdom, bringing the splendor of Ancient Rome to his own territory. Indeed, Ravenna’s buildings from that era have many Roman features. He was an excellent ruler and a restorer of ancient monuments. Many of the places of worship filled with dazzling mosaics date back to Theodoric’s reign. Theodoric’s tenure also brought peace to Italy. These were good times. For the most part, at least. 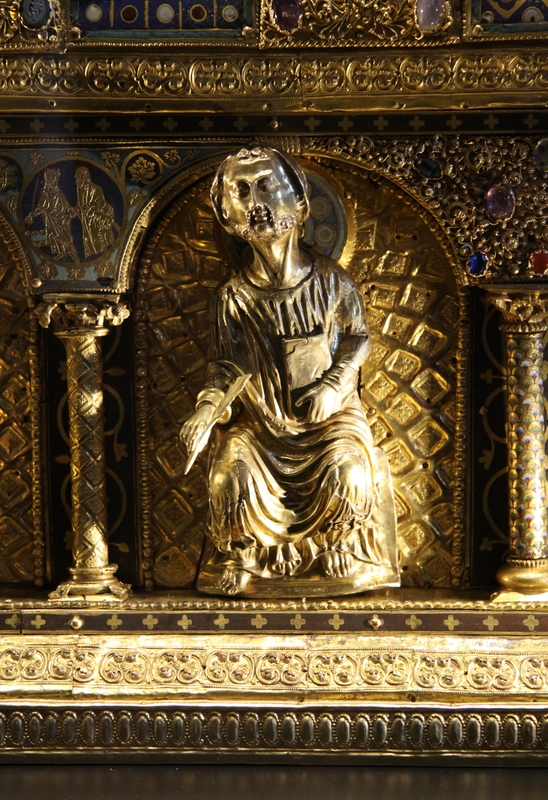 However, there was more than a little fiction between Theodoric’s religious beliefs and those of the Byzantine Emperor Justinian I. Theodoric promoted Arianism, which focused on the relationship between God the Father and the Son of God. Nonetheless, Theodoric demanded that his people be tolerant of other religion, and he did not attack Catholicism. 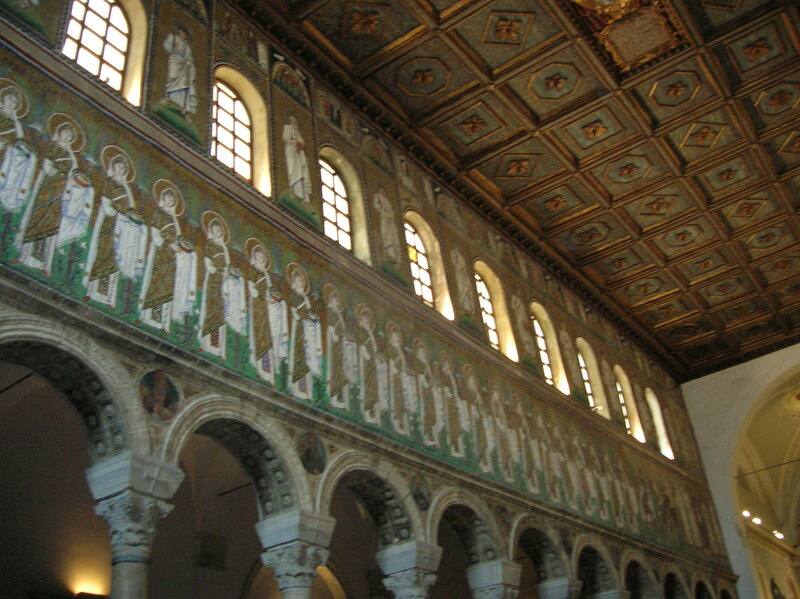 Ravenna went through many changes when the Byzantines took over in 553, led by Emperor Justinian I. 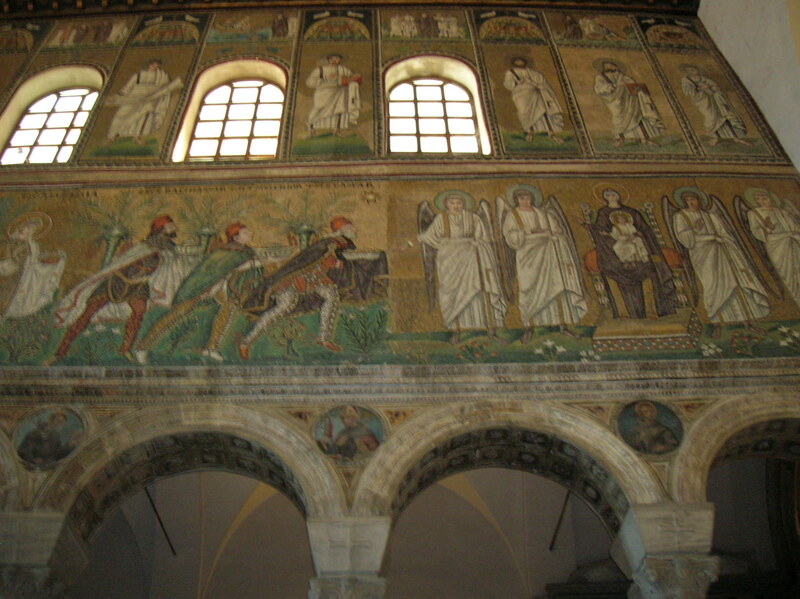 While the Byzantines brought with them a dramatically different culture and religion, Ravenna still flourished with its mosaics. Ravenna’s magical era came to a definitive halt when the Longobards took charge of the city in 751, but the monuments remain a testimony to the city’s past splendor and significance in Europe. 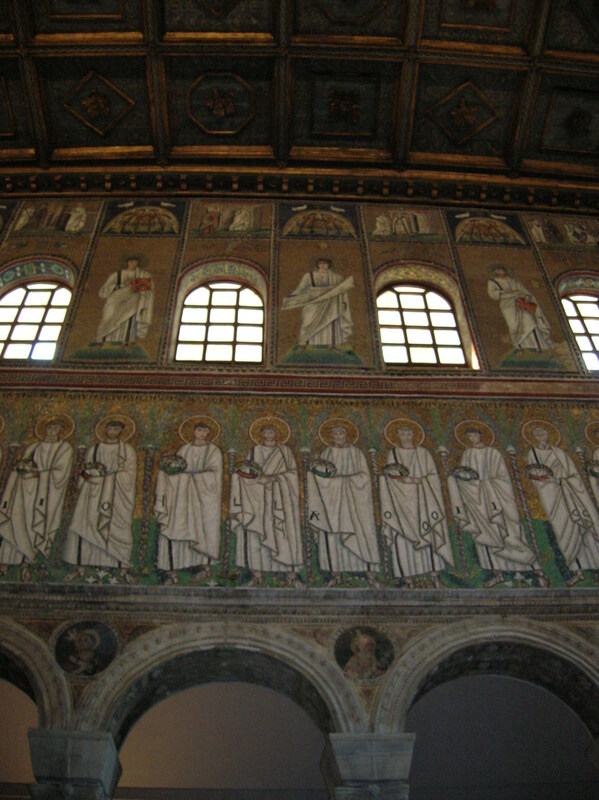 Ravenna includes eight sites on the UNESCO World Heritage List – the Mausoleum of Theodoric, the Mausoleum of Galla Placidia, the Neonian Baptistery, the Arian Baptistery, the Basilica of Sant’Apollinare Nuovo, the Chapel of San Andrea, the Basilica of San Vitale and the Basilica of Sant’ Apollinare in Classe. First we visited the Mausoleum of Theodoric, which the ruler had constructed in 520 AD. A UNESCO World Heritage site since 1996, this structure made of Istrian stone is the only king’s tomb from Theodoric’s era. While I was disappointed that there were no mosaics inside, I was intrigued that the roof was made of one piece of Istrian stone weighing 300 tons. 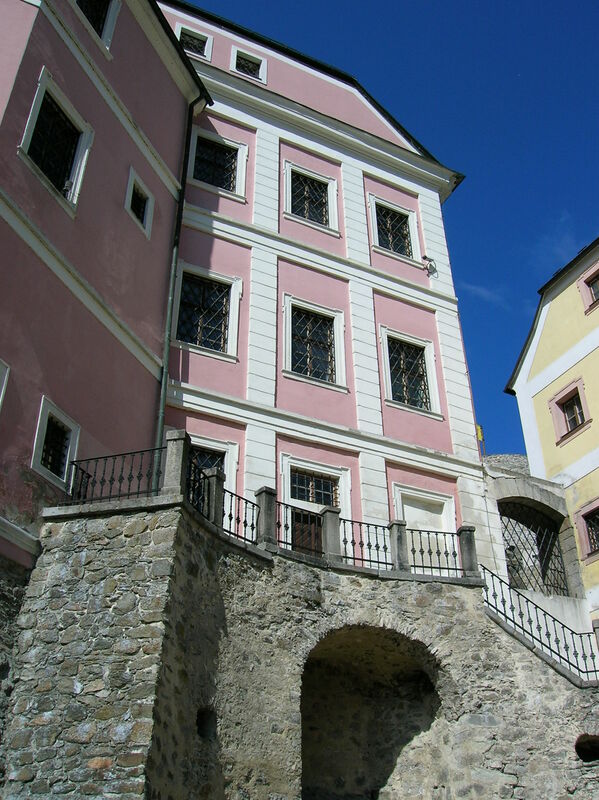 There were two floors, and Theodoric had once been buried on the upper level where a porphyry stood in the middle of the small space. I walked slowly around the porphyry, trying to imagine Goths paying homage to their dearly departed leader. 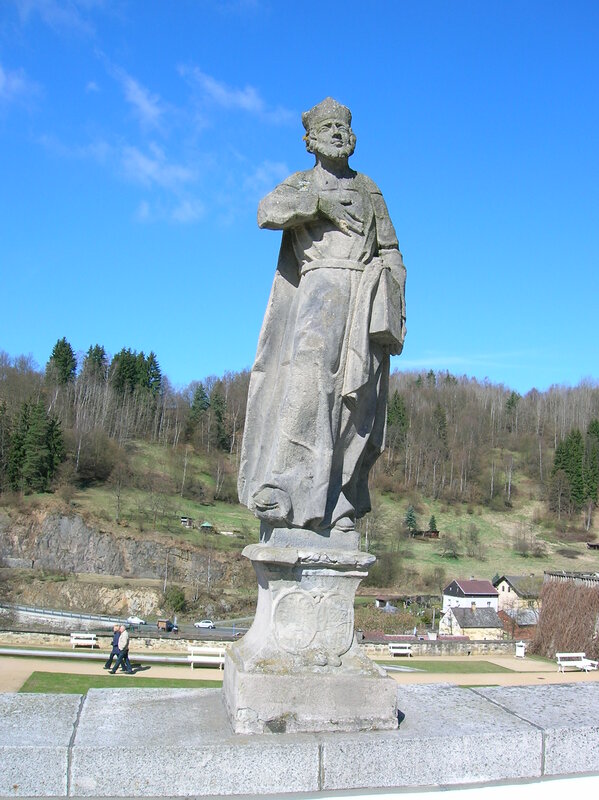 Would they have put flowers on the porphyry? What kind? Or laurel wreaths? I mused that they must have paid elaborate respects here. I imagined the people were pondering over Ravenna’s future, a future without the ruler who had brought peace to Italy and had brought architectural and artistic glory to the city. When the Byzantines came to town, Theodoric’s body was taken away from the mausoleum and the place served as a Christian oratory. Next we visited the octagonal-shaped Neonian Baptistery, which hailed from the turn of the 5th century. 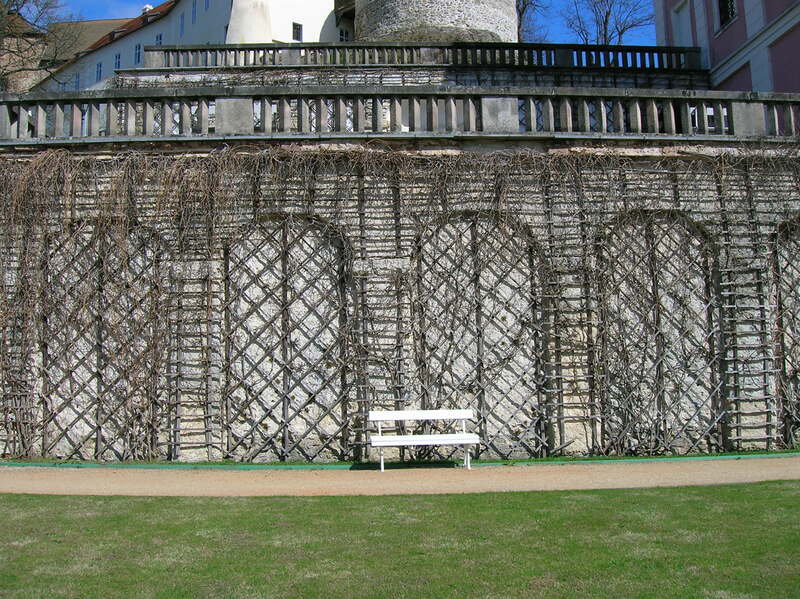 Even though the structure was small, it held so many delights. 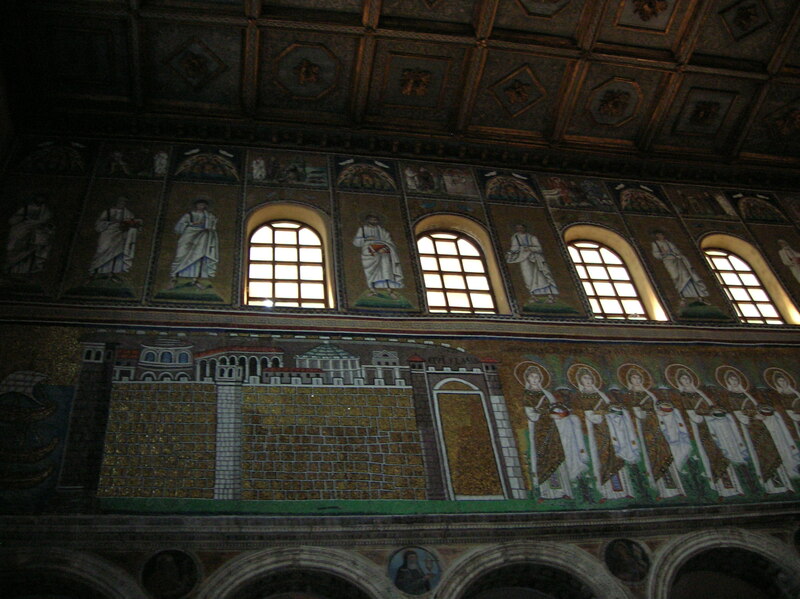 My introduction to Ravenna’s mosaics was enthralling, to say the least. 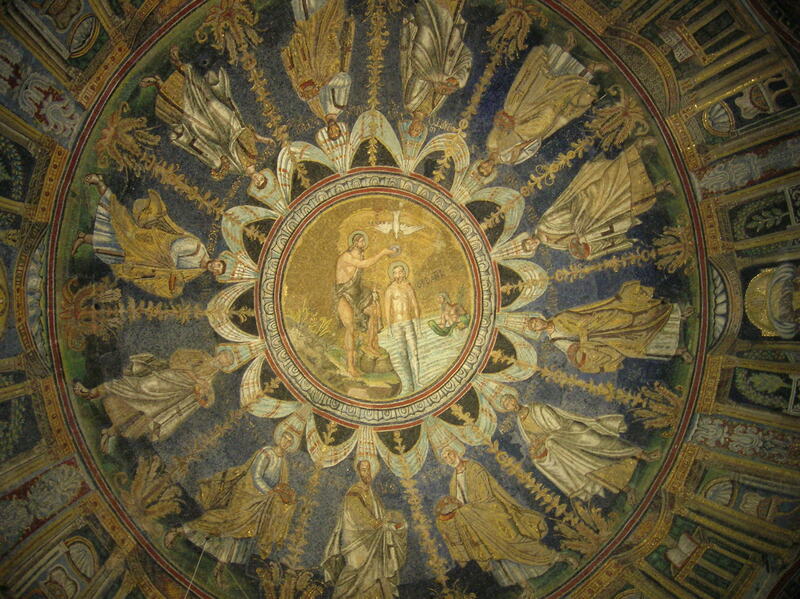 The mosaic-covered dome features the baptism of Christ in the center as John the Baptist poured water over Christ’s head. Even though only the dome showed off mosaics, it was overwhelming. To think that these mosaics dated back to the end of the 4th or beginning of the 5th century! The Mausoleum of Galla Placidia would only make my morning more fascinating. 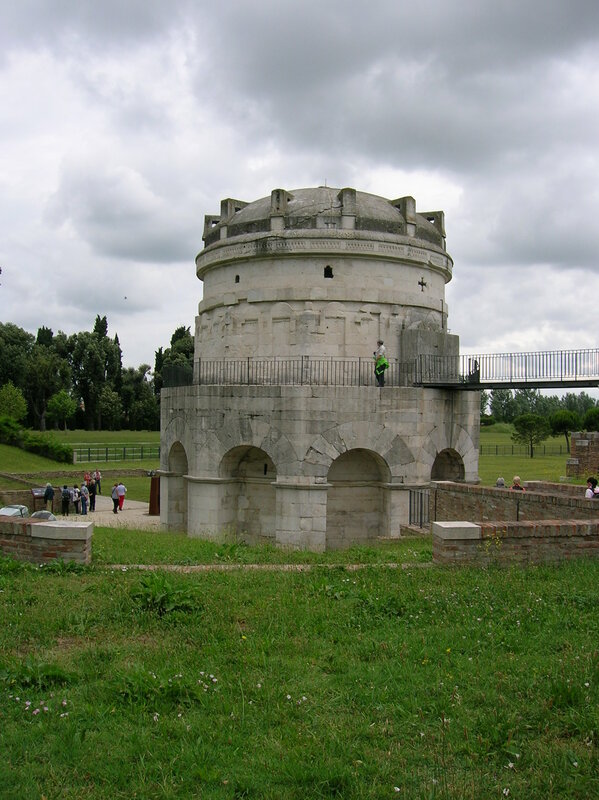 This structure was built to house the tomb of the daughter of Emperor Theodosius, Augusta Galla Placidia, but it never served that purpose as her grave was in Rome. When her brother Emperor Honorius passed away in 423, Galla Placidia took charge because her son was too young to rule. 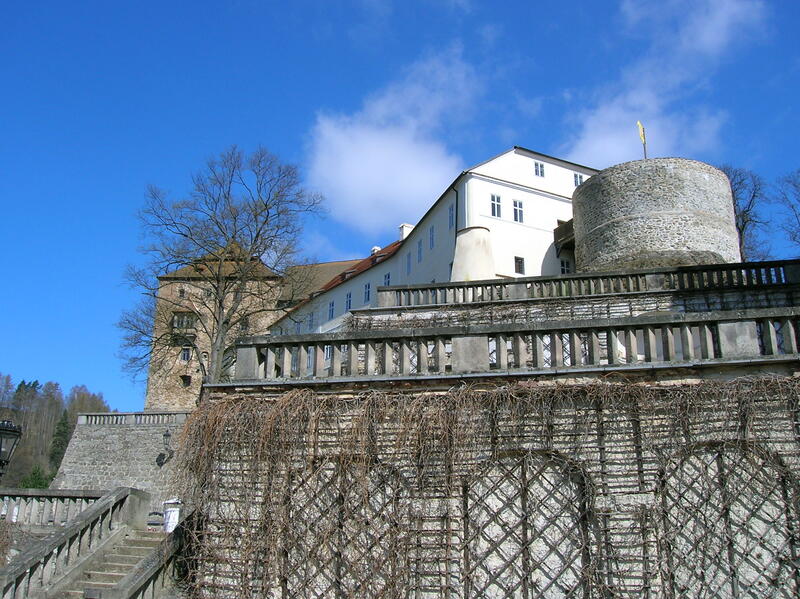 She was a very competent empress, and the city prospered artistically, for instance. My head was practically spinning. I was standing in a building dating from the 5th century! The Latin cross-shaped mausoleum featured mosaics on vaults, the central dome and lunettes on each end of the four vaults. The central dome was dominated by a cross studded with jewels. Golden stars and angels clad in gold were portrayed against a blue background. In the lunette over the main entrance the mosaic showed Christ gently caressing a sheep. The flock was totally focused on Him. I loved the gold color – Christ was dressed in gold attire and sported a golden halo. 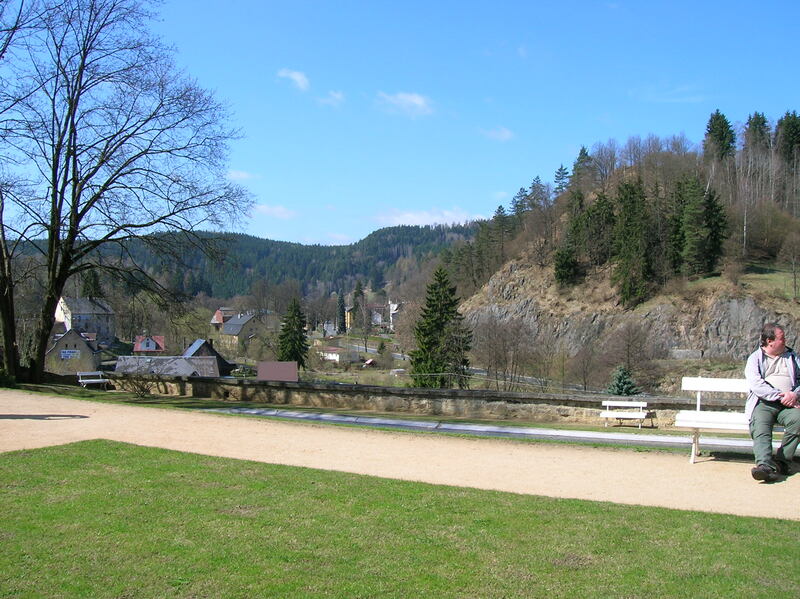 The lush green landscape was rocky, and the sky was a beautiful blue. Two lunettes featured deer about to drink baptismal water from a pool. Other details I loved included the red and white clouds on a blue background in the cupola and the books of the four Gospels depicted in one lunette. What fascinated me most about this mausoleum and about all the mosaics I had seen so far was the use of color. 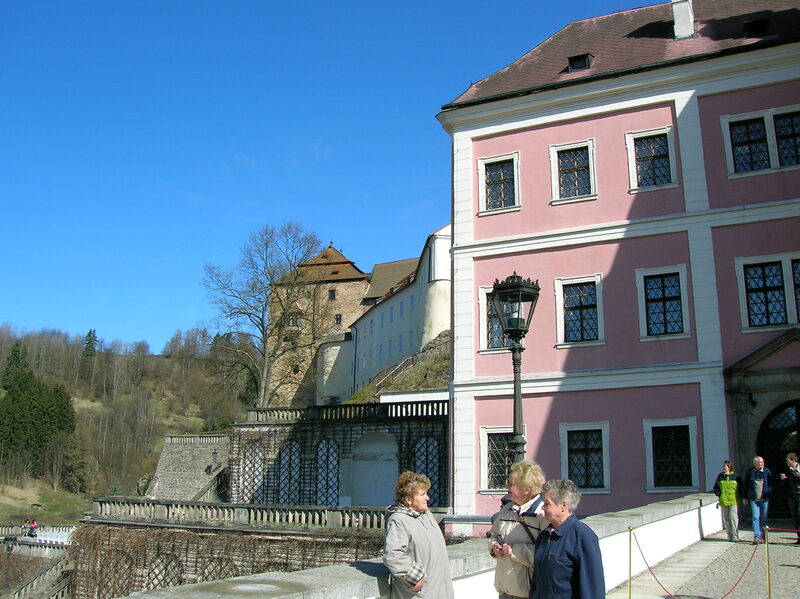 I could not believe that something so many centuries old could survive in such rich, vivid colors. The brilliant colors transported me back way into the past and also invigorated me with an energy to live life to the fullest in the present, making me feel truly alive. 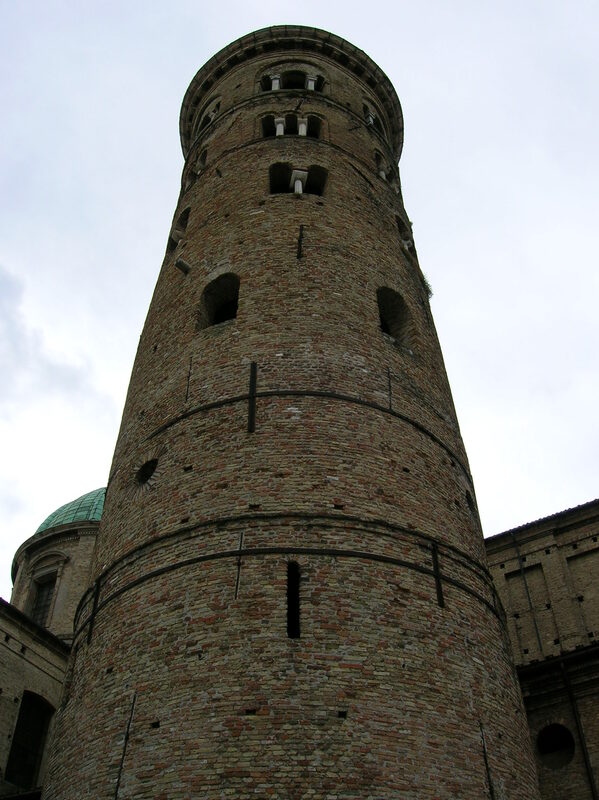 Dante died in Ravenna on September 13-14, 1321. Ravenna has a literary legacy, too. 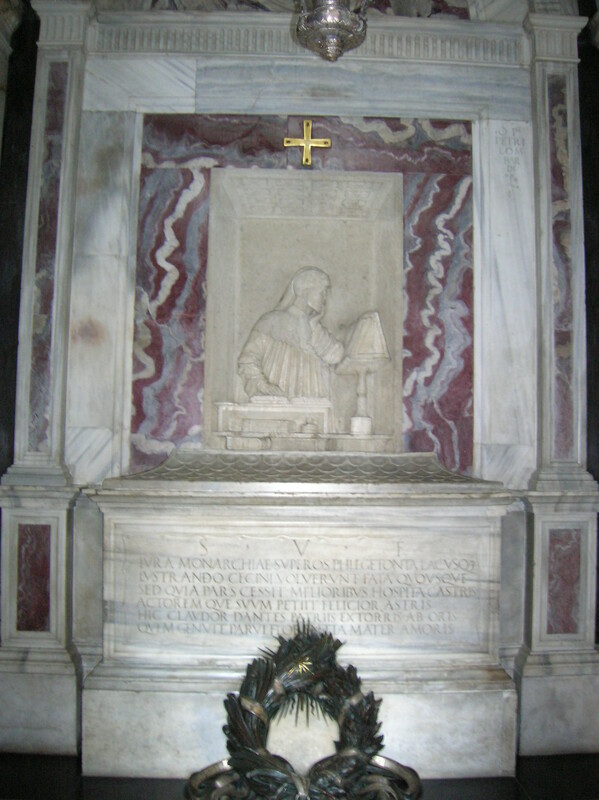 Dante died in Ravenna during the night of September 13 and September 14, 1321 after being exiled from his native Florence for political reasons. The Neo-classical, square-shaped temple that houses the remains of the author of The Divine Comedy and Vita Nova anthology is part of the Church of San Francesco, also called the Church of San Pier Maggiore. A sculpture of “The Supreme Poet” decorates the interior. I was standing in front of the remains of the man whose love for Beatrice had kept him alive. Here were the remains of the man who considered exile a kind of death in itself. I recalled an intriguing tale concerning Dante’s remains. The Florentines requested that Dante’s remains be returned to them in 1296, 1428, 1476 and 1519. Ravenna refused until 1519. 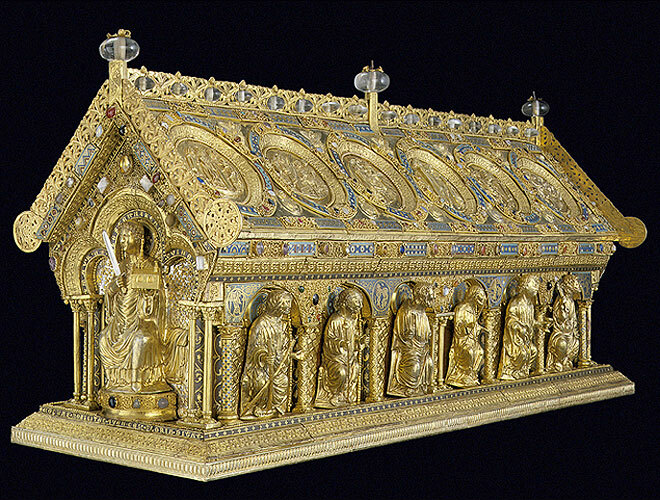 However, when the tomb was opened, the inhabitants of Ravenna discovered that it was empty. It remained a mystery for centuries. Then, in 1885, while reconstruction work was being carried out in the chapel, a small wooden box was found. 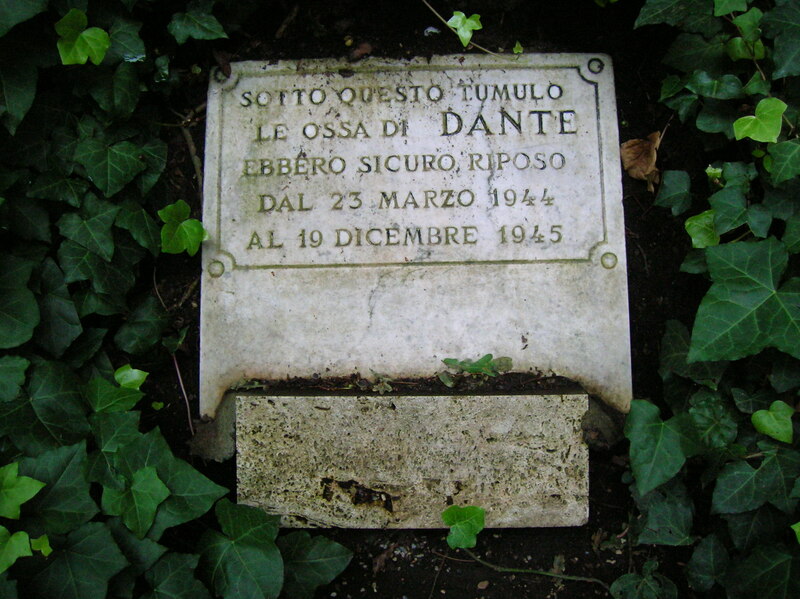 It included a note explaining that Dante’s remains had been moved there on June 3, 1677. The skeleton was nearly complete. So it seemed that Dante was not destined to leave Ravenna after all. Then we visited the Archiepiscopal Museum with its impressive Chapel of San Andrea, which had been recognized by the UNESCO World Heritage List in 1997. 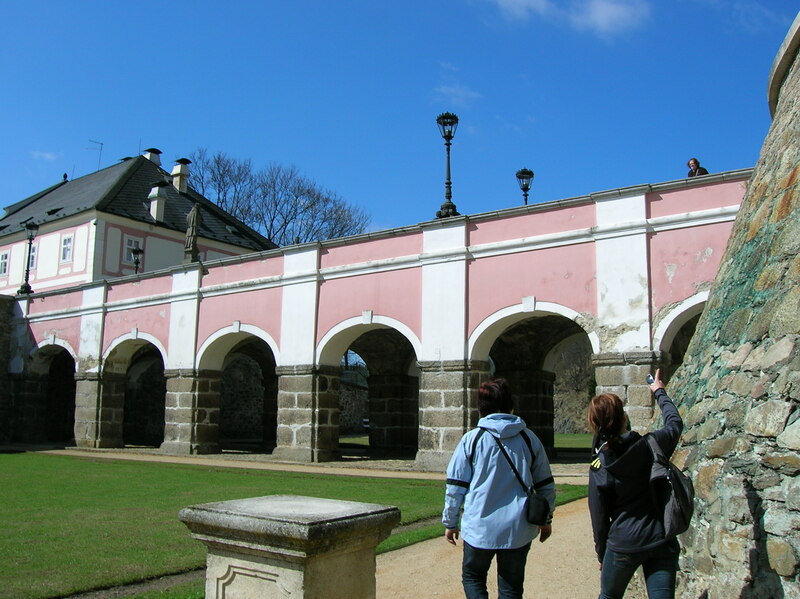 The chapel, shaped like a Greek cross, consisted of an oratory and atrium with barrel vault. It hailed back to Theodoric’s reign, when it was privately owned. I was intrigued at seeing Christ clad in armor on the lunette over the entrance. I could not remember seeing many portrayals of Christ in armor. I loved the star-studded sky background behind the cross in the apse. The sky made me feel safe, giving me a feeling of tranquility. 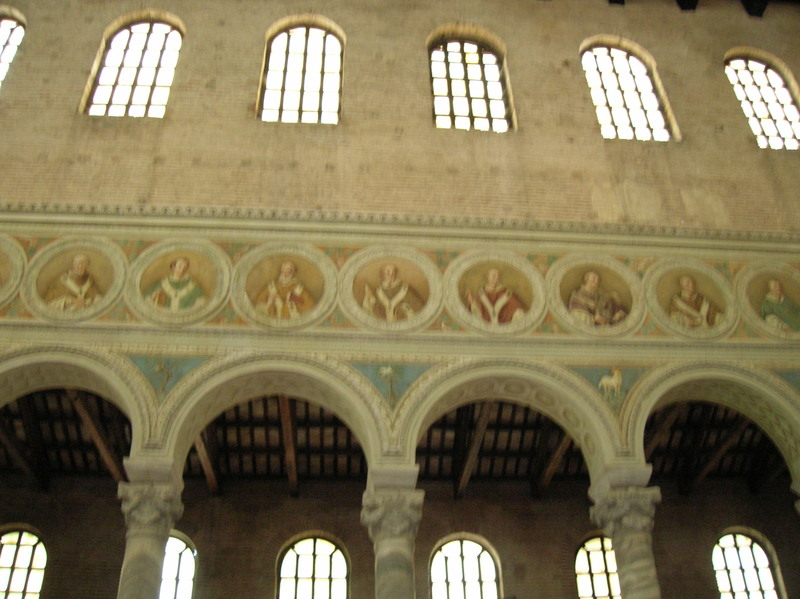 Medallions showed Christ, his Apostles and saints. The silver cross in the chapel could be traced all the way back to the 6th century. I was amazed by the attention to detail. No less than 40 images were depicted on embossed silver-plate medallions. 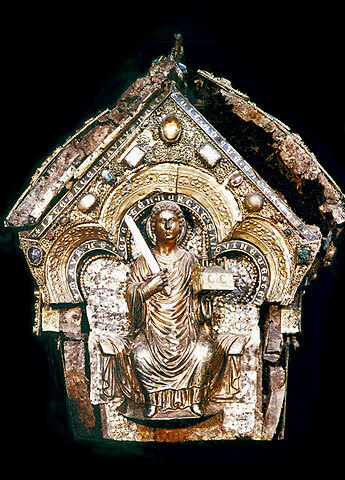 My favorite artifact in the museum, besides the chapel, was Maximian’s ivory throne. I inspected the detail of the ivory reliefs covering the throne. The reliefs included scenes from Christ’s life and much more. Next we visited what would become my favorite sight, the Basilica of Sant’ Apollinare Nuovo, constructed in the late 5th or early 6th century. Apollinare, sometimes referred to as Apollinaris of Ravenna in English, held a very important place in the history of the town. He was the very first bishop, and his tenure lasted 26 years. It is said he worked miracles. Because he promoted Christian beliefs, he had been banished from Ravenna. Apollinaris paid the ultimate price for his preachings. He was tortured: His persecutors repeatedly stabbed him viciously and poured scalding water over his wounds. He was killed with a sword and martyred. His remains were located in this basilica from the 9th century until they were transferred to the Sant’ Apollinare Basilica in Classe during 1748. The basilica we would visit last, Sant’ Apollinare Basilica in Classe, is located on the spot where Apollinaris was martyred. Back to the Basilica of Sant’ Apollinare Nuovo. 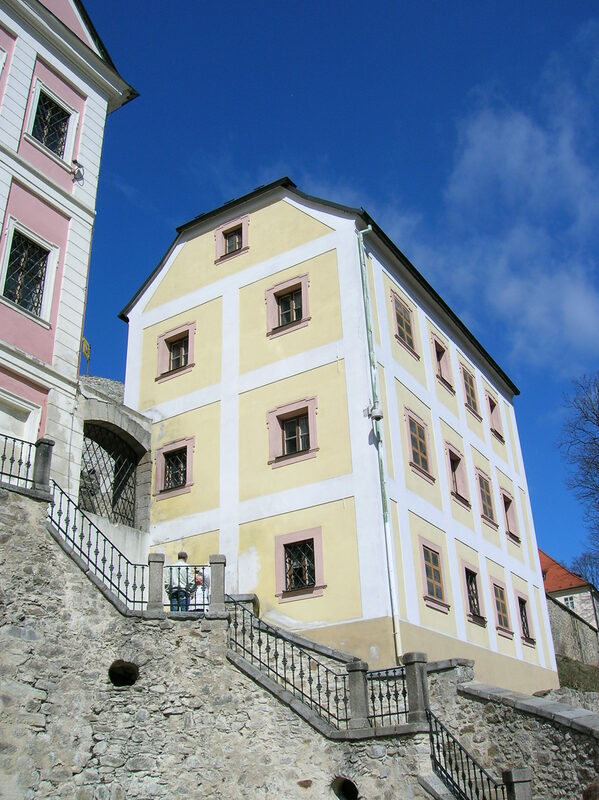 The exterior was simple in design. I noticed the marble portico, and the cylindrical bell-tower from the 9th or 10th century immediately caught my attention. Inside, the décor was not simple at all. The three-nave structure showed off 24 columns with Corinthian capitals but mostly boasted of the mosaics from Theodoric the Great’s reign. 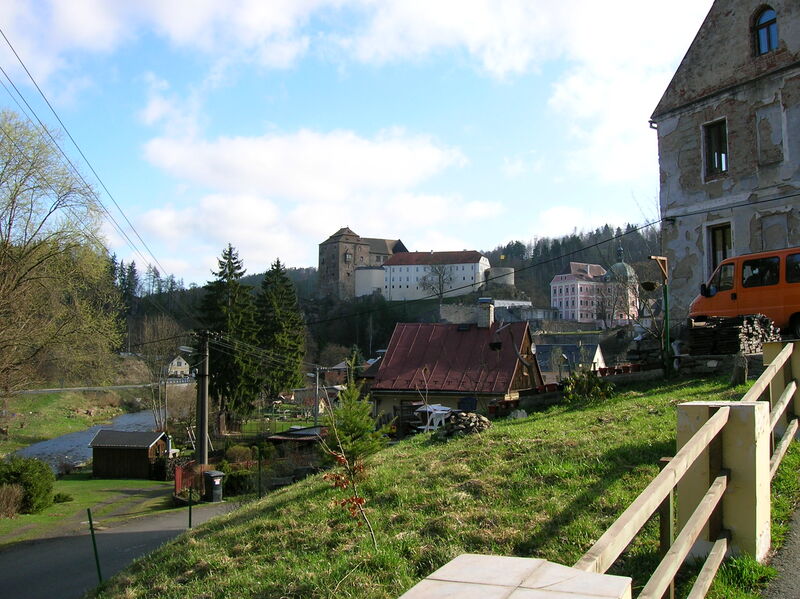 Originally this place had been intended as an Arian place of worship. I concentrated first on the mosaic of Theodoric’s lavish palace with loggias, arcades and a peristyle. 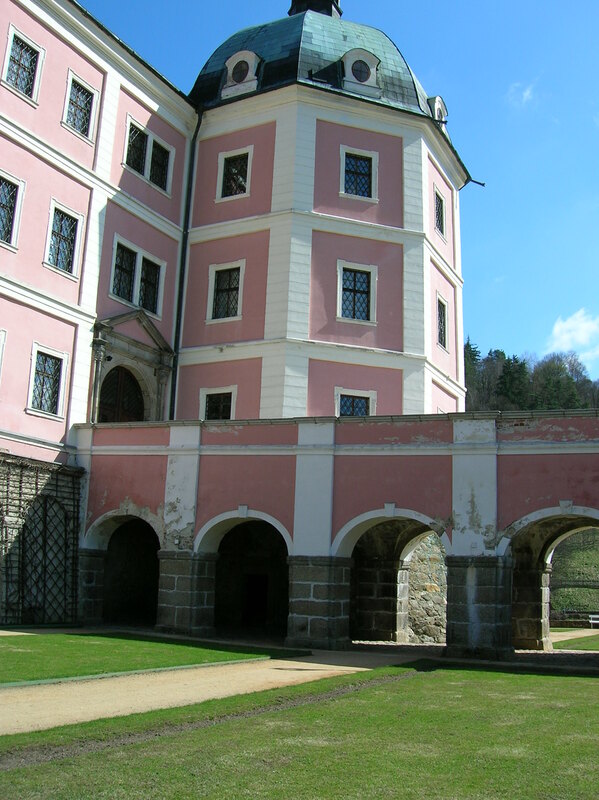 I felt as if I could walk into the palace, even though the rendition had some unrealistic spatial characteristics. Still, the palace looked so real to me. I could almost see Theodoric the Great strolling through the loggias. On the opposite wall I saw a representation of the port of Classe. One boat had a white checkered sail that looked as though it could be fluttering gently in the wind. It reminded me of those summers in Maine, staring at the boats floating in the bay. The portrayals of the processions caught my undivided attention. On one side there was a procession of 22 virgins and on the other a procession of 26 martyrs. Because some sections were added much later, it was possible to see Roman characteristics as well as the stylized Byzantine features. The 22 virgins were clad in golden tunics and donned crowns. Veils covered their faces. They were headed toward the Virgin Mary who held Jesus on her lap. While the Virgin Mary looked expressionless, staring straight at the viewer, in the four angels surrounding her I saw an attempt at differentiating facial expressions. The Three Kings led the virgins to the Virgin Mary. I noticed how their figures seemed to actually move, as they were bending forward toward the Holy Mother. There was much more to see. The octagonal-shaped Arian Baptistery had four apses. Even though only the dome’s mosaics have survived the centuries, it was rich in artistic treasures. In the center Christ stands in hip-high water as John the Baptist baptizes Him. Above Christ’s head is a dove. The outer circle is filled with crown-carrying Apostles separated from each other by palm trees. I liked the detail of the blue precious stones decorating the crowns. Next we visited Basilica Di San Vitale, which was consecrated by Bishop Maximian in 548. Bishop Maximian, often referred to in English as Maximianus of Ravenna, had served as the 26th bishop of the city. Emperor Justinian I had been his mentor, and the people had resented him for this reason, though he was able to convince them to trust him. Not only did he establish this basilica but he also had Sant’ Apollinare in Classe constructed. He was also a patron of illuminated manuscripts. And who was San Vitale? It is not clear. According to one legend, he was a martyred Roman soldier. I loved the way the light shined into the basilica. 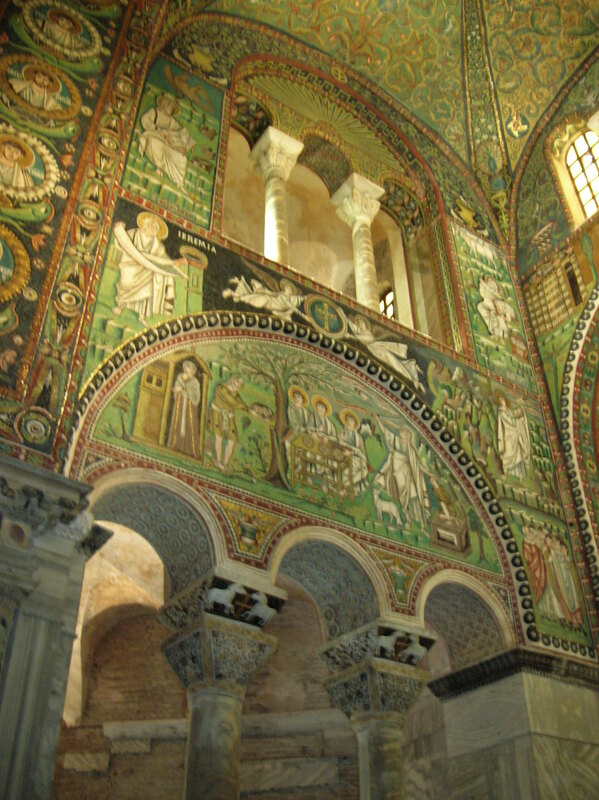 It enhanced the beauty and magic of the mosaics that were found on the walls and in the presbytery and apse, where I marveled at a mosaic depicting Christ, dressed in Roman attire, seated on a blue globe. While he presented Bishop Ecclesio with a scroll, the Bishop held up a model of the church. I noticed how lavish Saint Vitalis’ clothes were. I loved the golden background and especially the detail of the red, blue and white clouds. Another mosaic showed Emperor Justinian with Bishop Maximian and retinue, and yet another depicted Empress Theodora with her retinue. She was clad in purple, which made the mosaic even more brilliant in color. She wore pearls, a nice detail. I recalled that the empress had once worked in the circus as a dancer or bear-tamer. Who would have thought that this circus performer would become an intelligent politician? In the panel with Emperor Justinian I, loved the detail of the crown with sparkling emeralds. Bishop Maximian stood by his side gripping a golden cross. The detail of the precious stones that decorated the cross was phenomenal. I also noticed that the soldiers, all decked out in gold, were depicted as individuals rather than sporting the same facial expressions. I mused that they looked like they liked their jobs. It was interesting how the courtiers covered their hands in the presence of their rulers. 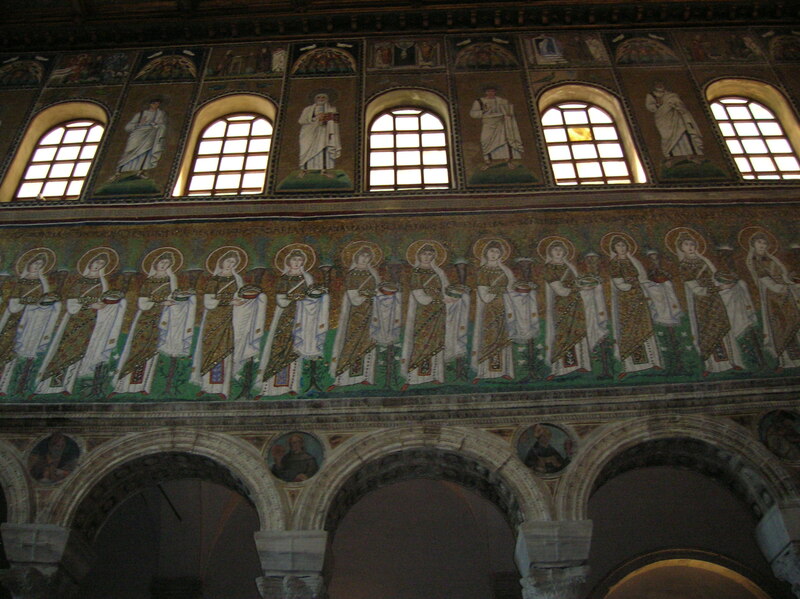 At the Basilica of San Vitale the panels with the emperor and empress bore typical traits of Byzantine art. In the rendition of Emperor Justinian and Bishop Maximian et al, the figures faced the viewer, and their faces lacked even the slightest hint of expression. Also, the figures were rigid. Yet this was a realistic portrayal as well because emperors were required to stand or sit completely still to impress on their subjects the divine solemnity of their rule. Still, there were some attempts to differentiate one character from another. What impressed me the most was the detail that had such historical value. I marveled at how a picture could speak a thousand words. Historians learned about the way people of this period dressed and what kind of hairstyles they had. The jewelry and fabrics of clothing were other helpful features for those interested in the era. 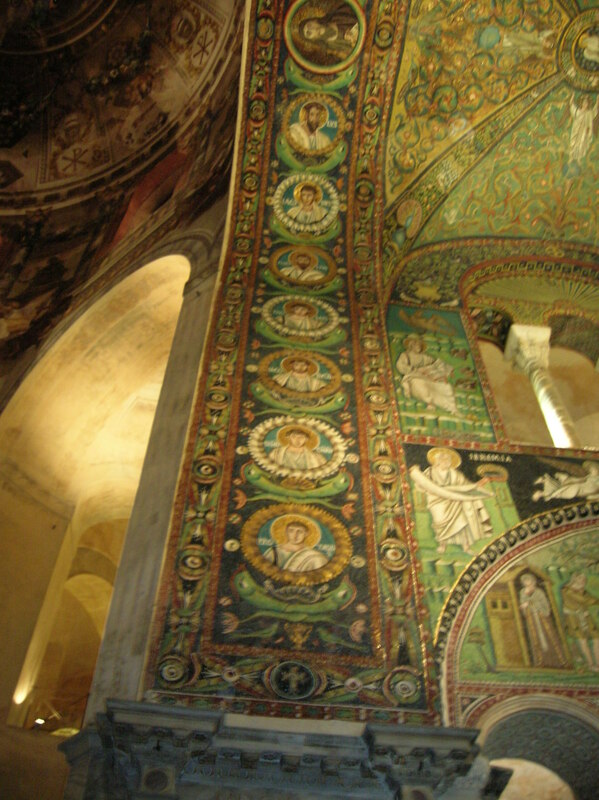 There were also many dazzling mosaics in the presbytery on the wall, loggia, women’s gallery and vault. I especially liked the four peacocks perched on blue and white globes. I liked the detail of the feathers. 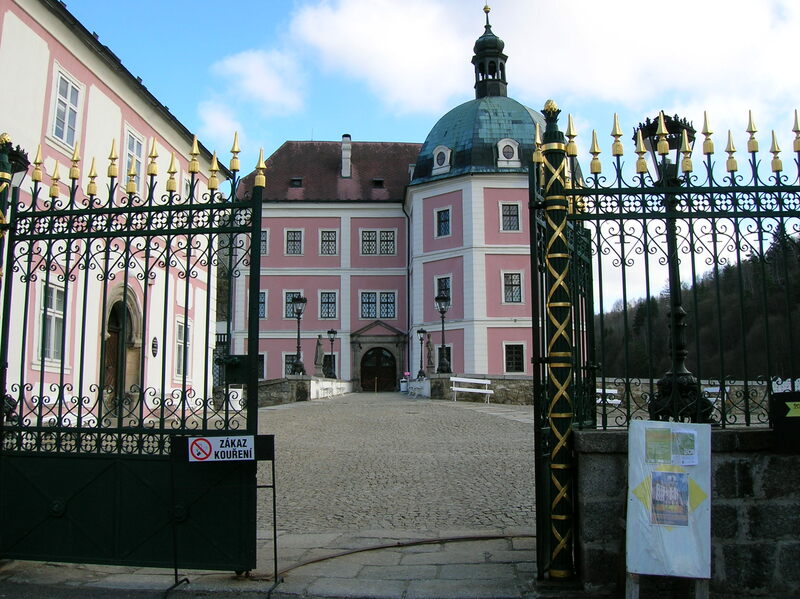 They brought to mind the peacocks strutting in front of Ploškovice Chateau during that visit to north Bohemia in 2005. I also was drawn to the star-studded sky. Lastly, we visited the red brick Sant’ Apollinare in Classe with its cylindrical bell-tower. The section of Ravenna called Classe had been situated on the seashore before the sea withdrew. 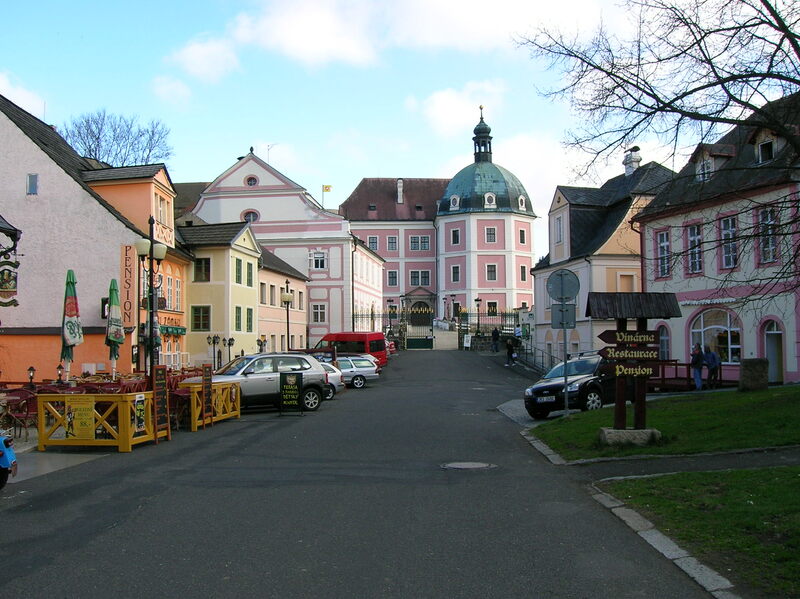 Construction started on the basilica in 532 AD, and it was consecrated in 549 AD. 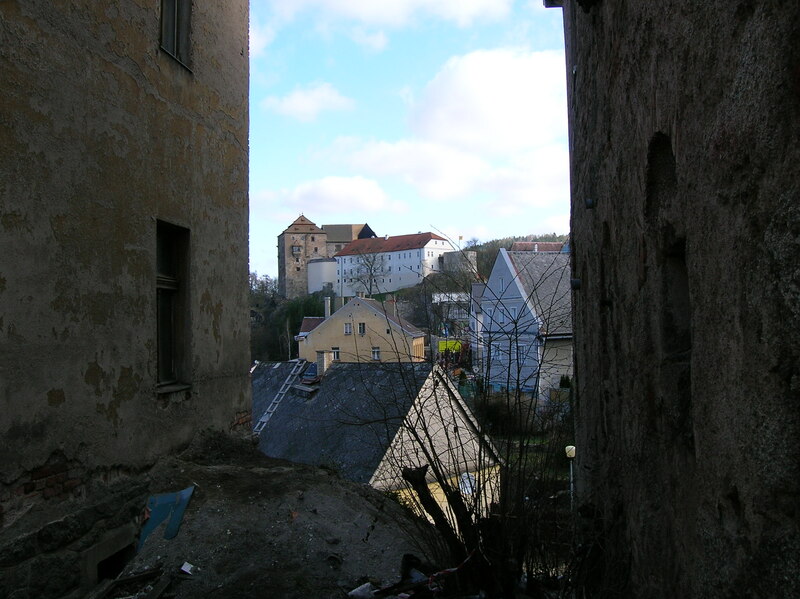 There used to be a cemetery here that included Apollinaris’ grave. 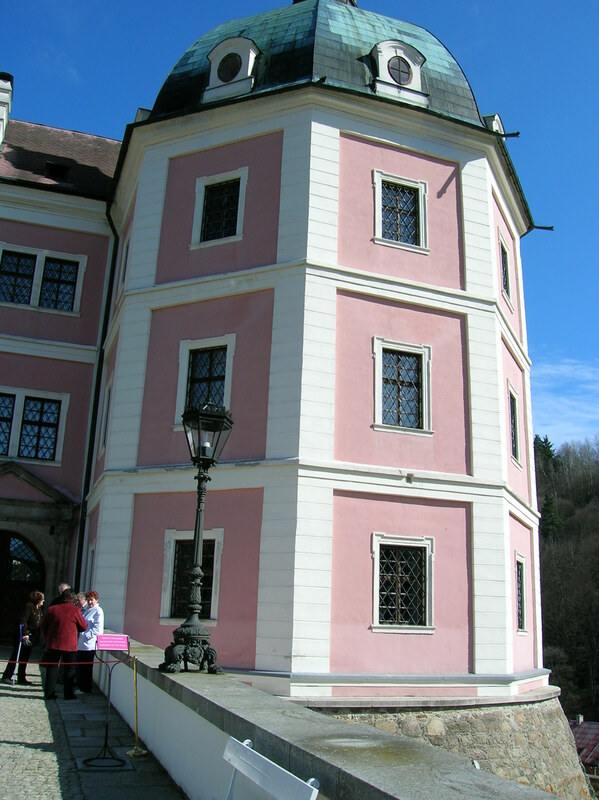 Inside there were two rows of 24 elegant marble columns with Byzantine capitals. 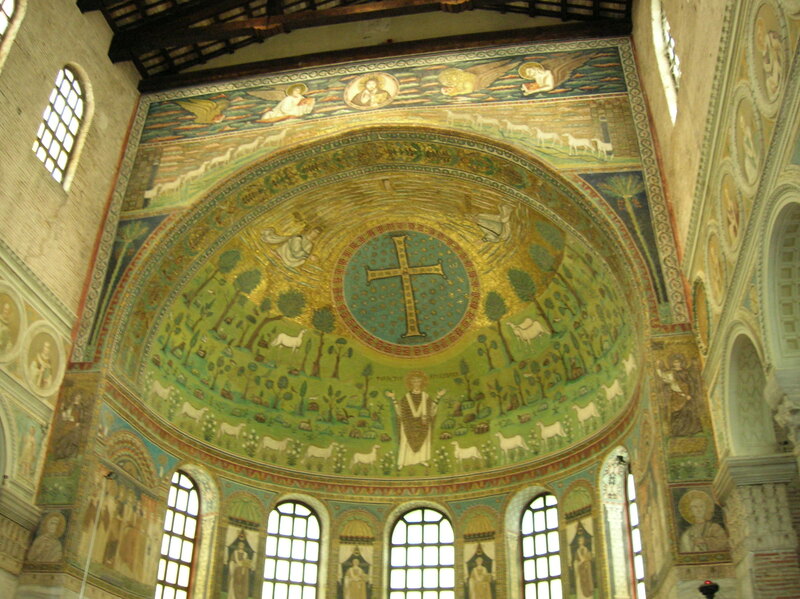 The apse was filled with mosaics of two parts – those above the cross and those below it. Above the cross we could see the transfiguration of Christ on Mount Tabor. There were 99 gold and silver stars in the background, or so I was told. I was too mesmerized by the stunning artistic treasures to count. The area below the cross was dominated by the figure of Sant’ Apollinare surrounded by 12 sheep among rocks and greenery. Apollinaris was raising his arms, gesticulating as he prayed fervently. Ravenna had more than lived up to my expectations. 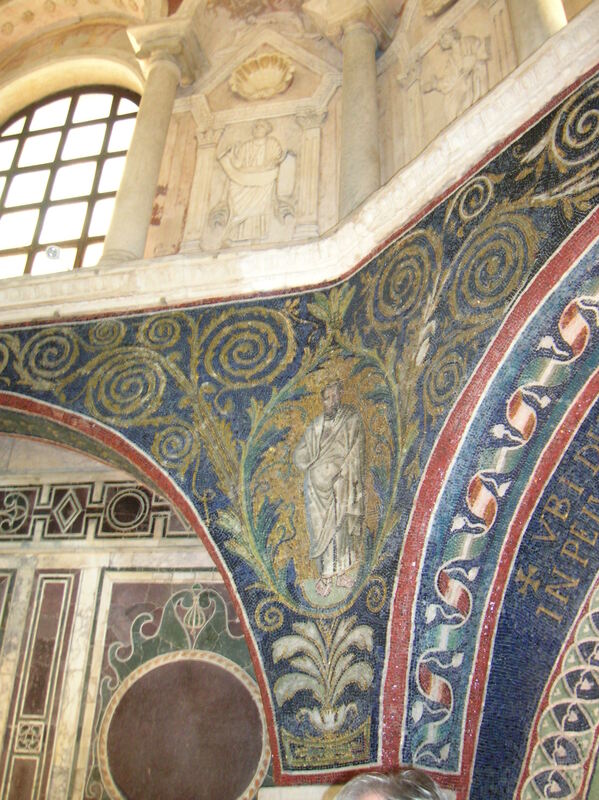 What captivated me most about the mosaics was the use of bright color schemes. The vividness of the images made the time periods when they were created all the more vivid. 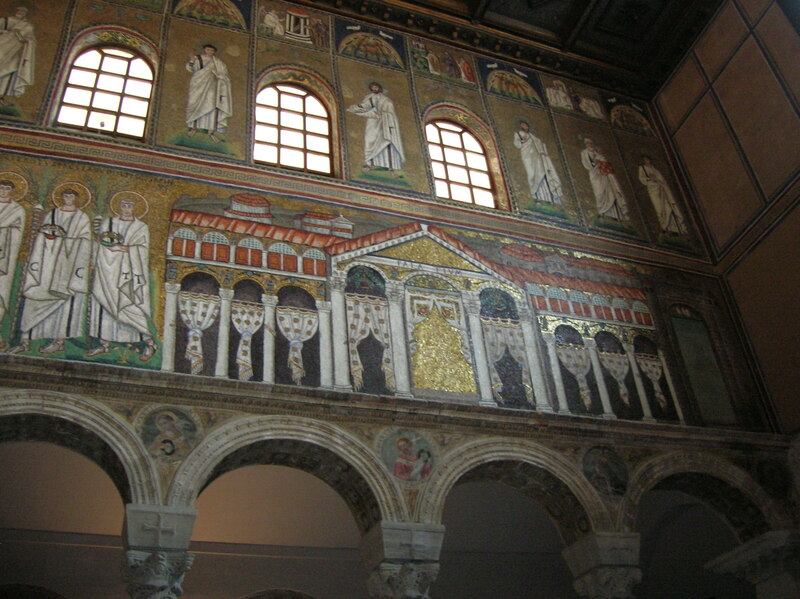 I had learned about Roman and Byzantine art and the Arian religion and now knew some of the names of the main players during Ravenna’s glorious days. I had seen Goth culture merge with Roman culture. I had seen red brick structures whose exteriors spoke of simplicity and harmony and whose interiors were complex and dazzling, filled with symbolism and color. We went back to Bologna, and I was more than satisfied with the day trip. I knew that Ravenna would always hold a special place in the memories of my travels.